Hello Firefox OS Enthusiasts. WP Photos is a new photoblogging application for Firefox OS, having support for both WordPress.com blogs and self-hosted WordPress blogs. With a simple interface, it enables the users to keep their photoblog up to date easily. 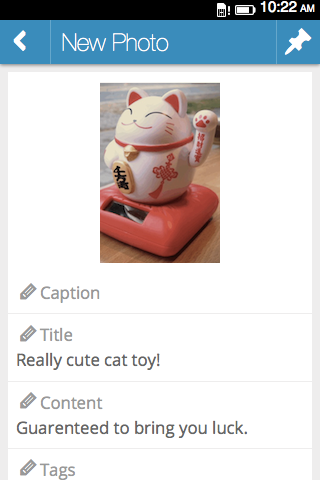 Just take pictures, add title, caption, tags and message, and upload them to your blog. The WP Photos app for Firefox OS can be freely downloaded from the Firefox Marketplace. For those who don’t know yet, Firefox OS is a new Linux based mobile operating system, built by using the new HTML5 technology by the Mozilla developers. For now, it is used as default on smartphones with modest hardware specs, developed by LG, ZTE, Alcatel and Geeksphone. The next Firefox OS based phone will be Huawei Ascend Y300II, which has better hardware specs than all the existing smartphones using Mozilla’s OS. It has been also ported experimentally on the Google Nexus 7 tablet, but there are some apps that don’t work yet. Also, there are rumors that Tizen and Firefox OS will unify, in order to have more chances to become important Android and iOS competitors.